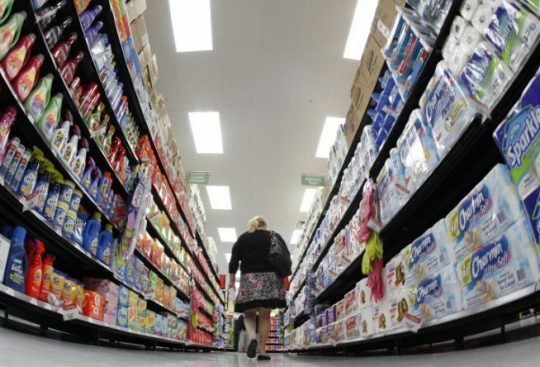 WASHINGTON (Reuters) – The U.S. economy grew at its fastest pace in nearly four years in the second quarter as consumers boosted spending and farmers rushed shipments of soybeans to China to beat retaliatory trade tariffs before they took effect in early July. Gross domestic product increased at a 4.1 percent annualized rate also as government spending picked up, the Commerce Department said in its snapshot of second-quarter GDP on Friday. That was strongest performance since the third quarter of 2014. Compared to the second quarter of 2017, the economy grew 2.8 percent. Output expanded 3.1 percent in the first half of 2018, putting the economy on track to achieve the Trump administration’s target of 3 percent annual growth. The second-quarter increase in GDP was in line with economists’ expectations. With Friday’s report the government also published comprehensive revisions to prior GDP data, which did not change the previously presented economic picture. Trump has also imposed tariffs on steel and aluminum imports, leading to retaliation by the United States’ main trade partners, including Canada, the European Union, Mexico and China. There was also a front-loading of exports of other goods in the second quarter. Import duties are seen undercutting economic growth, with higher prices for goods discouraging consumer spending and businesses shelving investment plans. Economists in a Reuters poll earlier this week predicted that growth will slow notably from here. Growth in consumer spending, which accounts for more than two-thirds of U.S. economic activity, increased at a 4.0 percent rate in the second quarter, accelerating from the first quarter’s stall-speed pace of 0.5 percent. Consumer spending is being driven by the lower taxes and a robust labor market, which created an average of 215,000 jobs per month in the first half of this year. General Motors Co GM.N, Ford Motor Co F.N and Fiat Chrysler Automobiles NV FCHA.MI FCAU.N on Wednesday cut their full-year profit forecasts, citing higher steel and aluminum costs. Harley-Davidson Inc HOG.N has warned that more expensive steel and aluminum and a 25 percent retaliatory duty imposed by the European Union on shipments from the United States could cost the motorcycle maker $45 million to $55 million this year. Investment in homebuilding fell for a second straight quarter in part as an acute shortage of houses available for sale reduced brokers’ commissions. Government spending grew at a 2.1 percent rate, quickening from the first-quarter’s 1.5 percent pace.